Q: How to share a flash book on the Facebook? Nowadays, many people are like to read e-book online and want to share it with their friends on many mainstream platforms such as Facebook, Twitter, Linkedin, Google and so on. So I want to know how can I enable my readers to share the flash flipbook and what is the process to share. 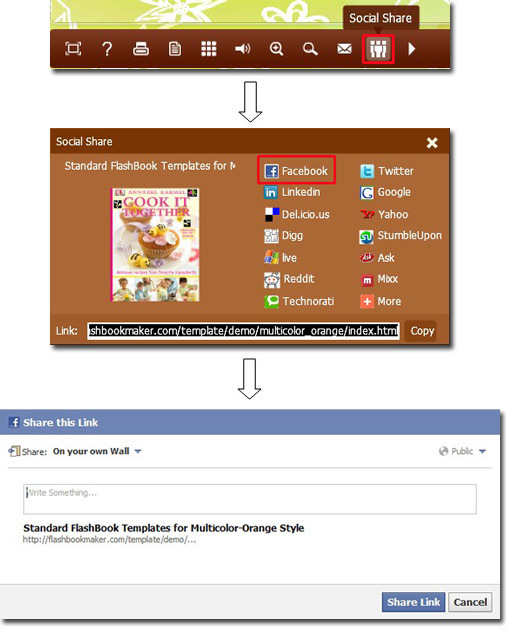 Well, I would like to give you some tips about sharing flash book on Facebook. Just follow the below simple steps, you will find it is easy. Step1: make sure that the “Social Share Button” is “Show”. 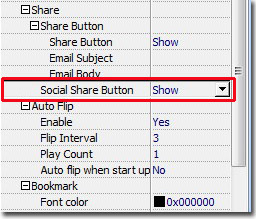 Step2: a social share button will be show in the toolbar. Your readers can click this button and share the book to Facebook directly.